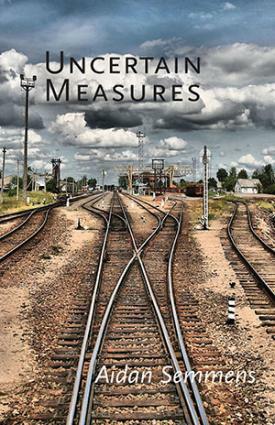 'Uncertain Measures' by Aidan Semmens, Shearsman Books, Bristol, 2013, 92pp. Aidan Semmens is a freelance journalist, published in both national and regional newspapers; these days he is a blogger too, as well as an excellent photographer. In the wider field of poetry he edits an online poetry magazine called (enticingly for fans of James Joyce) "Molly Bloom". One of his other publications is "By The North Sea: An Anthology of Suffolk Poetry" (Shearsman Books, 2013), a collection he edited of work by past and present poets with strong connections to the county. It’s as varied, lively, intelligent and interesting an anthology assembled with a tight geographical focus as I’ve come across (though I should declare an interest as some of my own poems appear there). "Uncertain Measures" is the focus here, however, the third collection of his own poems, preceded by his first book, A Stone Dog (Shearsman Books, 2011), and "The Book of Isaac" (Parlor Press/Free Verse Editions, USA, 2013) which the poet Peter Riley called ‘… surely one of the most fascinating books of poetry to be published this year.’ Three volumes of his own poetry and an anthology in the space of three years may suggest a man in a hurry, and that may or may not be true. It’s no secret that after a youthful interest in poetry and some success more than thirty years ago Semmens seemed to have abandoned poetry for his career in sports journalism. In this century, however, he has rediscovered the Muse, or she found him again… But I need to stress that, while he has had the good fortune to see volumes appearing recently in quick succession, this should not be taken as implying any kind of writing too hastily rushed into print. He’s an ambitious and poetically very intelligent writer, and all these books show a high level of accomplishment. If his title of "Uncertain Measures" might hint at a degree of hesitancy, as if trying to ward off criticisms in advance by admitting to a lack of self-confidence, there’s no sign of that here – we live in very uncertain times, after all, old certainties have decayed or vanished, little in life or indeed the universe can be relied on, and it would be very strange if these concerns did not appear among his principal themes, but uncertainty is not a quality of this writing. John Keats famously instructed poets to load every rift of their subjects with ore. The final stanza here does that beautifully, the worn fingers picking at the seams, perhaps, of threadbare garments, but also suggesting the labouring pitmen ‘picking’ at seams of coal, and with the closing emphasis on the slow, no doubt arduous, but vital process of rediscovering, of unforgetting, what went into those communities, and what lessons need to be remembered. Or re-remembered. And becoming aware of the consonants at work in such precise and moving fashion in ‘musty air of mystery’ might prompt an attempt to probe what it is that’s mysterious, and why it might remain so without ‘the slow recovery of knowledge’. This brief extract might also suggest something about the way Semmens writes, some of the aspects of his style that set him apart from many contemporary English-language poets. I don’t think it serves any useful purpose to try to pin a label on him such as ‘avant garde’ or ‘modernist’ or ‘post-modernist’, not least because experimentally distorting or ‘distressing’ some of the norms of English verse expression has had its adherents for over a century. But it’s immediately obvious, for example, that Semmens has almost abandoned the use of the uppercase font apart from the titles and a few proper names, and likewise punctuation. This isn’t as drastic as it sounds because of course poetry still uses lines shorter than the width of a page (with the exception of prose poems), and line-length itself creates meanings, forcing the reader to attend to where it begins and ends, and its relationships to the preceding and following lines. One of the threads that runs through Uncertain Measures, appearing in several poems in different parts of the book, is an awed fascination with the history of nuclear power and its weapons and devices, testing sites such as those from the last century in Nevada and Arizona, the fact that their terrifying power cannot be uninvented. (This volume is dedicated, not incidentally, to the memory of his aunt, Laura Arnold, who was a much-respected nuclear historian.) The first of two ‘Test Site’ poems begins with ‘the morning they tested Galileo / on a 500-foot tower / before doomed Joshua trees’ to be followed by ‘the brilliance of the flash / that fuses sand into glass’ and ‘a sharp and slightly painful click / precedes the thunder’, and because the poem is placed only a few pages after the landscape of the opening poem, scarred by various forces of the industrial revolution, that tiny detail, the ‘tiny click’, made me think back to another such little but very telling detail in the earlier poem, the sound of hot iron cooling in ‘forged / ingots still ticking from the foundry’… Semmens does this over and over again in these poems, and these little cross-references and reverberations both deepen and illuminate this highly unified, powerful collection, with its depictions of the broken but fascinating archaeologies of our history, and his passionate hatred – the word is not too strong, I think – for the multiplicity of injustices we heap upon ourselves. Many of the places he visits in these poems, whether in Britain or the USA or eastern Europe, are not named. The descriptive details are precise and vivid, but they are selected for wider application – these places, towns, regions, have many twins. The bus-stop advertising for ‘Toys’R Us on Karl-Marx Straße’ in ‘A Listening Station’ may be in former East Berlin, but not only there. We have learned that the world is much less vast than we used to think, just as we realise that the past, even the ancient past and its relics and beliefs, are not so far away as we used to imagine. Other sites of interest, however, seem from their titles to be as specific as ‘Walls of Troy’, but deceptively so: ‘a tarry scarred place / of oilcan homesteads / jewelled swordhilts and aerosols / tankers rusting in the breakers’ might be almost anywhere (except, no doubt, the site of Troy). And that famous place of slaughter, bravery and cowardice, rivalry, broken agreements, vivid characters which have lived for nearly three thousand years in the sagas of Homer, has a link to another poem which is named. ‘Aldgate East’ is one of my favourite poems here, with its aura of seedy decay ‘where executives come and go / lights reflecting on their shoes / as they ignore the place where stony earth /has broken through the paving’, their eyes no doubt fixed on their ‘shining tower’ of offices. Everywhere there are signs of a declining civilisation’s detritus, ‘the corpse of a bicycle’, ‘standing water full of broken / instruments and scraps of paper’ and, the poem suggests, as in times past, we may not have much control over what happens, for all our scientific knowledge and advanced technology – ‘we may not believe in Greek gods / but everywhere see their powers at work / the possibility of extreme revelation / in an abandoned coach station’, and we recall that in such ancient times human beings had no control over their gods and therefore none, actually, over their lives. And while this may nominally be the East End, it is redolent of almost any other modern city in the world: ‘there are pockets of ancient superstition / around the entrances to the underground / railway, signs of an outlived revolution…’ as if some our achievements amounted to little more than new entrances to hell. A final example: more than once, as in ‘Test Site’ above, the name of Galileo appears. This reference is to one of nearly thirty nuclear tests carried out in Nevada in 1957. These highly controversial tests which ran for years were the kind where soldiers were used as human guinea-pigs to study the effects of radiation… The ironies of naming some of these activities after such historical luminaries as Galileo, Kepler, Newton, Pascal et al. are too much to bear. The Galileo who makes brief appearances in ‘Test Site 2’, however, is the historical version, the 17th century Italian astronomer and scientist who argued that the earth went round the sun, and was tried and imprisoned for the rest of his life by the Vatican, having been forced to recant. Unfortunately he could not provide concrete evidence to support his theory, and so found himself treading ‘a perilous path between heaven revered / and heavens revealed / through a telescope unravelling / as a challenge to human intelligence’. The sardonic ending reveals that ‘modern primitive peoples’ who recycle the discarded products of advanced countries ‘seek ways to monetise their artefacts / the middle finger of Galileo’s right hand / encased in a gilded glass egg’. This sounds as if it indeed belonged somewhere ‘Beyond Imagining’, the poem’s title. Not so. The finger’s on display in a Florence museum… These references to one of the world’s greatest scientists and how his thought and discoveries have been treated at various times succinctly reveal much about human nature, yet in none of these instances does Semmens’ use of Galileo ever seem gratuitous or forced. Copyright © Rodney Pybus, 2014. �Copyright � John Mingay, 2014.